1. 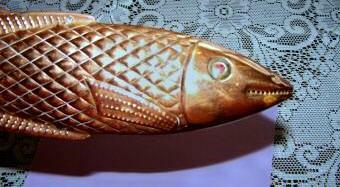 An old copper spearing decoy – large 14 inches long and 4 1/2 inches deepand about an 1 1/2 inches wide. It looks like it had to be hammered out to the the width, but may haave been put in a press of some kind to make it round. Nice scale detail. It is suppose to have come from south Minneapolis Minnesota area from back in the 30s. It appears to be of two pieces of copper cut out like a fish and then soldered together. 2. 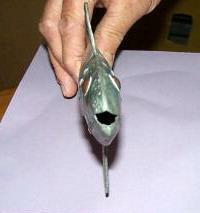 This decoy is from a galvanized metal and is soldered together. Its eyes are copper and the fish is 13 inches long. 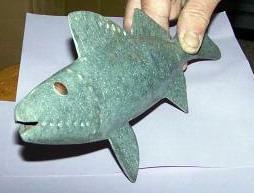 It is believed to be from the Minnesota area. 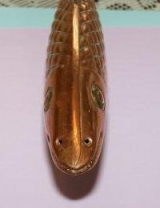 Here you will find a copper decoy as fine as any you will ever see. Believed to be from the Minnesota area.